Just recently I had the true pleasure of visiting with some friends on their boat. 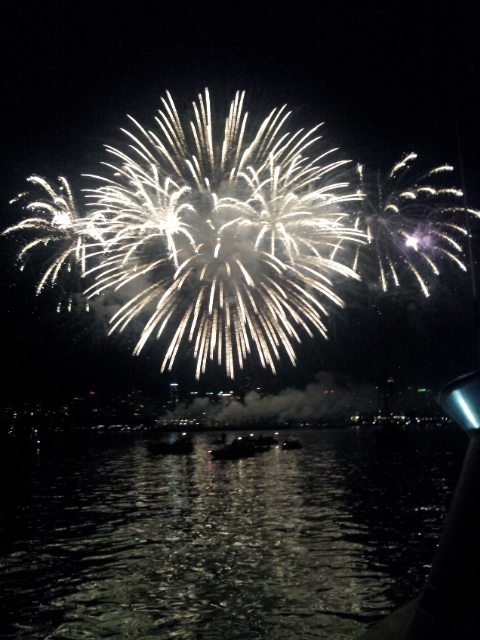 We had planned to go out on the water to watch the fireworks over the BC Day (long weekend). There is something very rhythmic and serene about spending time on the open sea. Upon arriving at the marina beneath the Burrard Street bridge, you’re welcomed by rows and rows of beautiful boats. After spending hours on the boat eating, drinking and listening to music, time truly felt like it was floating away. Around 9:30 pm, we decided to make our way to English bay to witness was to be one of the most spectacular fireworks displays of the vancouver Celebration of Lights Festival. If you ever get the chance to see fireworks up close and personal, take the opportunity, because it will be a memorable experience. Kitsilano Connection • No Comments on I’m on a BOAT! !